Before we go again, shouldn’t we take the chance to recall our last summer? That one where Mamma Mia! (DVD/Download) shattered box office expectations to become a colossal hit and had much of the female population saying “Gimme! Gimme! Gimme!” and eating Greek yogurt? Send an SOS- it’s time to listen to Pierce Brosnan “sing” once more. I’ll admit- I genuinely enjoy this movie. Despite the cheesiness, despite the lackluster musical abilities of the majority of the cast, despite the enviable tans I know I’ll never personally achieve…. it gets to me. The pain of lost love, the suspense of a paternity reveal, and the tumultuous bond between mother and daughter are like the storylines from a soap opera. And we all know how much I like those. Plus, there’s ABBA music, beautiful scenery, and shirtless bartenders. Really, this film just screams Liz Locke. While most eyes are focused on Meryl Streep, her lovers, and the VERY tan Amanda Seyfried, I’m more interested in the drunk old ladies played by Julie Walters and Christine Baranski. They’re like a kinder version of AbFab’s Patsy and Edina. Always with the fruity pink drinks, these two. While watching Mamma Mia!, get your Greek on and enjoy this Honey, Honey cocktail. In a highball glass, muddle the fresh grapefruit, mint leaves, and honey together. Fill with ice, add Ouzo, grapefruit juice, and Campari. Top with sparkling water, and garnish with another slice of fresh grapefruit and mint. Whether you’re watching the original or the new sequel Mamma Mia! : Here We Go Again (I’m still LOL’ing over that title), be sure and have a cocktail on hand. You don’t want to let the opportunity for a drunk sing-a-long to “Dancing Queen” slip through your fingers. Cheers! Posted in Musicals and tagged ABBA, Amanda Seyfried, grapefruit, greece, greek cocktail, honey, Mamma Mia, Meryl Streep, movie musical, musical, ouzo. Bookmark the permalink. This month marks a milestone for Cinema Sips. It has officially been 3 years since I started this blog on cocktail and movie pairings, really as a bit of a lark, but with a small shred of hope that people would actually enjoy reading it. After 180 posts, I am proud to say that I have never missed a week, I have not yet had to check into the Betty Ford clinic, and I’ve made a grand total of $5.05 through affiliate links (I’ll take it!). In truth, there might not be a Cinema Sips without this week’s film Julia & Julia (DVD/Download). The story of a lost New York writer who blogs about her attempts at Julia Child’s recipes definitely got me thinking about blogging, and what in my life I could write about that other people might find interesting. My collection of vintage postcards? Eh, not so much. Cocktails and movies? Heck yes! Directed by the late, great Nora Ephron, Julie & Julia is actually two movies in one. In one half we see blogger Julie Powell trying to find her path in life, using Julia Child’s recipes as a compass. In the other half we see Julia Child herself, learning the art of French cooking in 1950’s Paris, writing her masterpiece, and being generally adorable with her husband. Amy Adams plays Julie Powell and Meryl Streep steals the show as Julia Child. As with all of her roles, Streep is utter perfection, and Child’s zest for life becomes infectious through this performance. I have to admit, if I weren’t in a similar life situation to Powell, I might not have liked the modern-day half of the movie. Not anyone’s fault- it’s just hard to compete against Julia Child and Paris in the 50’s. But because I am a blogger, and because I also get terrified that the only person who reads this blog is my mother, I find comfort in watching her story unfold. In thinking about my cocktail pairing this week, I asked myself what would Julia Child drink? The answer- whatever the hell she wanted! She might even get a little tipsy while cooking. After all, if no one’s in the kitchen, who’s to see? While watching Julie & Julia, I recommend drinking a French Martini. Shake all ingredients over ice until chilled, then strain into a martini glass. 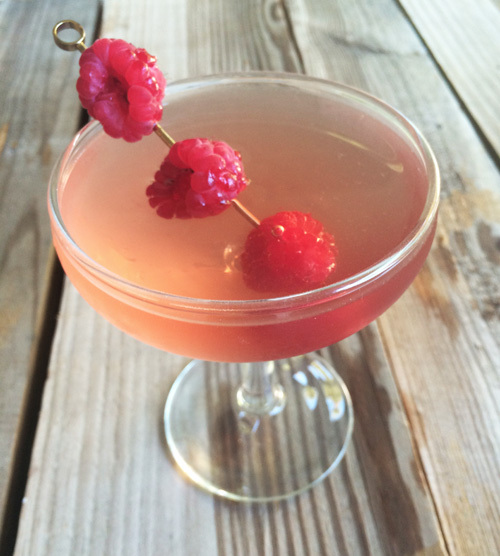 Garnish with a raspberry. Admittedly, when I started this blog I didn’t have much faith in my ability to follow through and keep up the weekly posts. But it’s the awesome feedback I’ve received over the years that has really motivated me. Cinema Sips has made me a better writer and photographer, and it’s made me more adventurous in trying new cocktails. For all the readers who have followed this blog, and all the readers still to come, you are the butter to my bread, and the breath to my life. Cheers! Posted in Uncategorized and tagged Amy Adams, Blogging, French Cooking, French Martini recipe, Julia Child, Julie & Julia, Meryl Streep, movie cocktails, Nora Ephron, Stanley Tucci. Bookmark the permalink. Sorry to do this again to my readers, but I’ve got another tearjerker for you this week (okay maybe not a tearjerker for everyone, but for me, watching this means I’m sitting there, a blubbering mess on the sofa, while my husband rolls his eyes.) 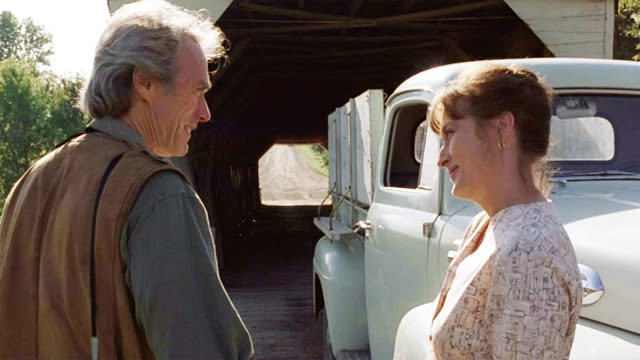 The Bridges of Madison County (DVD/Download) is a film that I consider to be one of the most romantic ever made. I’m definitely a sucker for love stories with unhappy endings, and maybe it’s because I like knowing that I’ve already seen the best of what this couple has to offer. I’m not missing out on anything after the movie ends. The romance in The Bridges of Madison County only exists for the two hours I’m watching this film, and that’s okay. The fact that it’s a slow burn of a romance makes it even better. The Bridges of Madison County is based on the bestselling novel by Robert James Waller. Adapted by screenwriter Richard LaGravanese and directed by Clint Eastwood, the film also stars Eastwood as wandering National Geographic photographer Robert Kincaid, who meets Meryl Streep’s character Francesca Johnson while on assignment photographing covered bridges in Iowa. Francesca is an Italian war bride who came to America in hopes of grand adventures with her husband, but now finds herself shuffling around a country kitchen in middle-of-nowhere Iowa. Her husband and two children leave town for the weekend to attend a farm show, leaving Francesca alone. Alone, that is, until a rusty pick-up driven by Clint Eastwood pulls into her driveway and her life changes forever. Eastwood is absolutely magnetic in his role, and even though he was in his mid-60’s when he made this film, I dare you to find a sexier romantic lead in recent history (I’m certainly stumped). Something about his lithe frame and piercing blue eyes just gets me every time. My drink this week pays homage to Francesca’s Italian roots. I was lucky enough to be gifted a bottle of Cocchi Americano by some very lovely and generous friends (one of whom is from Iowa! ), along with a recipe for a White Negroni. I’d made the mistake of ordering a classic Negroni while on honeymoon in Italy, and I was definitely not a fan (I still wonder if I was served cough syrup). However, I’m a big fan of this version. Boozy and bright with a twist of lemon, this is a great drink to sip while you’re watching Meryl Streep and Clint Eastwood flirt with the idea of running off into the sunset together. When viewing The Bridges of Madison County, I recommend drinking a White Negroni. Mix liquid ingredients in a cocktail shaker with ice. Strain into a chilled coupe glass, and garnish with a generous twist of lemon. Of course Meryl Streep does a phenomenal job with the Italian accent in this, and while stocky and average in appearance at the beginning, she seems to transform under the gaze of Clint Eastwood into a beautiful, vibrant woman. As she reminisces later on, “I was acting like another woman, yet I was more myself than ever before.” I love this idea, that finding one’s true soulmate can change you into the person you were meant to be. Toward the end of this movie, I’m definitely shouting at the TV when Meryl has her hand on that car door handle, and weeping like a baby at that final scene on the bridge. I would say they don’t make romantic tearjerkers like they used to, but then came The Notebook. That’ll have to wait though, I’m all cried out. Cheers! Posted in Dramas and tagged Clint Eastwood, Cocchi Americano, Meryl Streep, movie cocktail, The Bridges of Madison County, White Negroni recipe. Bookmark the permalink.